Corton come from the conventional calligraphy on a gravestone from an old English village. This may sound really bizarre. But one look at this amazing text and you would fall for the magnificently lively air that surrounds it. The typeface is armed with idiosyncratic lively serifs and pleasantly swashed downstrokes. 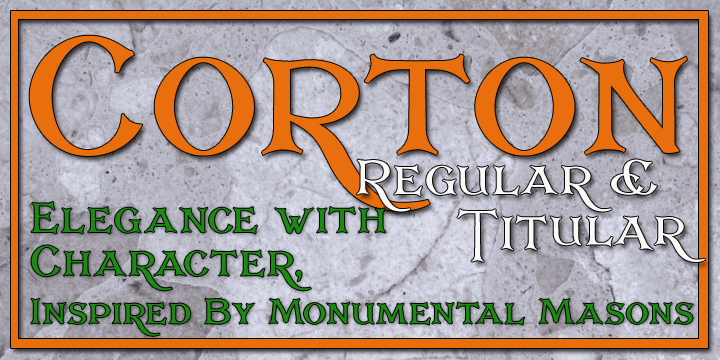 Corton is tagged along with eight faces including regular and titular each in three weights. The regular condensed is also available. Amidst these weights, are ideal signage and display faces. These amalgamate quaint appeal and fun spirit Without losing out on the much required clarity and legibility.